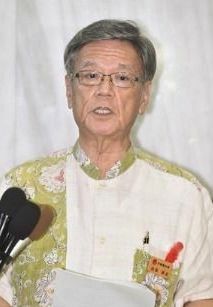 Governor Onaga expresses outrage over the riot police officer’s use of the term “aborigines” to describe Okinawan protesters at the Okinawa Prefectural Office on October 19. At an interview on October 19 at the Okinawa Prefectural Office, Governor Takeshi Onaga gave a comment in regards to the riot police officer who used “dojin,” a derogatory term for “aborigines,” to refer to Okinawan protesters. Onaga said, “The implication is [that Okinawans are] inhabitants of an uncivilized region. As an Okinawan citizen and as the governor, I feel not only that [use of this term] is outrageous and inexcusable, but I also feel strong resentment.” For the first time Onaga expressed the desire that riot police officers from outside the prefecture be withdrawn. On October 20 Onaga complained to the chief of the Okinawa Prefectural Police Katsushi Ikeda about the discriminatory remark, and requested adequate management of the riot police. Onaga said, “I am obliged to state that leadership [of the riot police officers] has not been sufficiently attentive.” He will also confirm his point of view with the chairman of the Okinawa Prefectural Public Safety Commission.